Four scrapbooks documenting the life and career of baseball player Ray Scarborough are now available on DigitalNC. Scarborough was a one-time all star and World Series champion who pitched for several major league baseball teams in the 1940s and 1950s. He often received attention from the national press due to his off-season job as a pickle salesman in his hometown of Mount Olive. The scrapbooks are from the local history collection in the Wayne County Public Library. Scarborough, a native of Mount Gilead, attended Wake Forest, where he was a star pitcher on the baseball team in the late 1930s. He taught high school briefly in Tabor City before beginning his professional baseball career with the Chattanooga Lookouts. 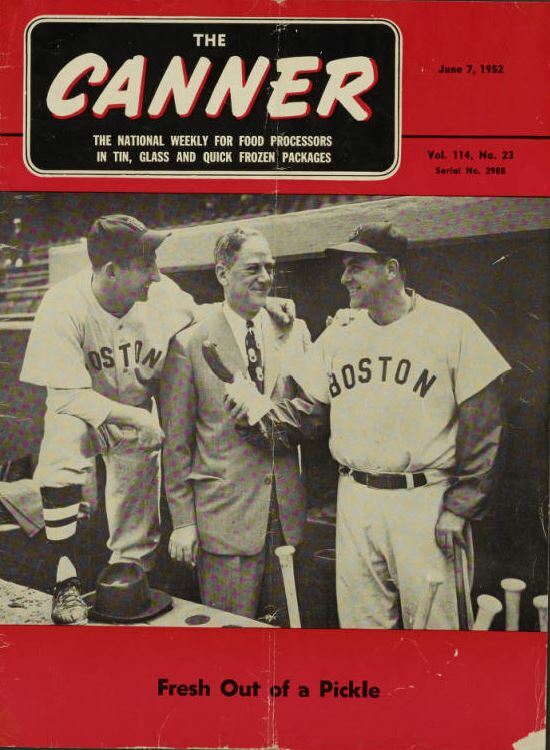 In 1942, Scarborough signed his first major league contract with the Washington Senators. 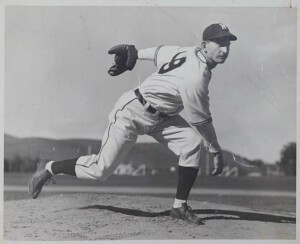 Scarborough pitched for the Senators in 1942 and 1943, then spent two years in the Navy. He rejoined the Senators in 1946 and spent the next eight years in the big leagues, pitching for the Senators, the Chicago White Sox, the Boston Red Sox, the New York Yankees, and finally the Detroit Tigers before retiring in 1953. He was an all star in 1950 and was a member of the Yankees 1952 World Series championship team. Scarborough finished his career with a record of 80-85 and an ERA of 4.13.
season), players often had to find additional work in winter. 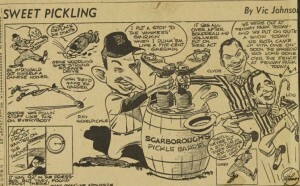 Scarborough was a salesman for the Mount Olive Pickle Company, much to the delight of journalists in New York and Boston who called him the “Pickle Peddling Pitcher” and frequently ran cartoons showing him dunking opposing players in pickle barrels. Scarborough played up the connection himself, looking for opportunities to expand the market for Mount Olive’s famous “Carolina Beauty” pickles.